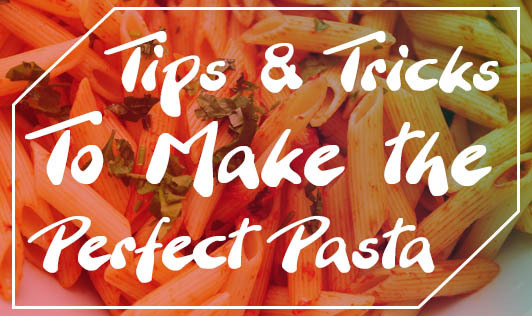 Have you ever struggled with cooking a perfect pasta dish? Here are a few tips and tricks to get your pasta cooking the right way. To prevent pasta from sticking together when cooking, grease the pot/pan with a cooking oil spray before adding water or add a few drops of oil or a small dollop of butter to the water. Fill your pot with enough fresh water so that when the pasta cooks and expands, there is plenty of room for it. You would also require enough water when the pasta is added. Adequate water helps balance the heat and allows the pasta to come back to a boil quickly. An easy way to calculate water quantity is to add 3 liters of water for every 250g of pasta. Add enough salt to the cooking water while making pasta as that will ensure that your pasta is seasoned properly. Don’t cover the pasta while boiling as the water tends to overflow. Instead keep a wooden spatula over the pot which will prevent the water from overflowing. It is not a good idea to add pasta to a pot of water that isn’t boiling, as this will only leave you with a gooey, overdone dish. Do make sure to check the package for the proper cooking time as each type of pasta has different cooking times. Give the pasta a stir as soon as you add it to the water. It will prevent it from sticking it to the bottom of the pan and prevent the pasta from sticking together. Never make the mistake of cooking two different varieties of pasta together unless they are similar in size and shape, as they have varied cooking times. Always save some of the water used for cooking the pasta. It will be useful to add it in the sauce to make the sauce stick to the pasta. It is a good idea to drain the pasta just enough to remove excess water. As the pasta dries up the starch in it tends to dry off and this makes the pasta stick together. Keep the sauce ready before you cook the pasta. Now add the cooked and drained pasta to the sauce immediately so that the sauce can stick easily to the pasta as well. With these foolproof techniques, you will be able to get your pasta always right.